The community school in Grefrath was built with the same planning concept as the raspberry coloured primary school in Frechen. Both schools appear in friendly colours. 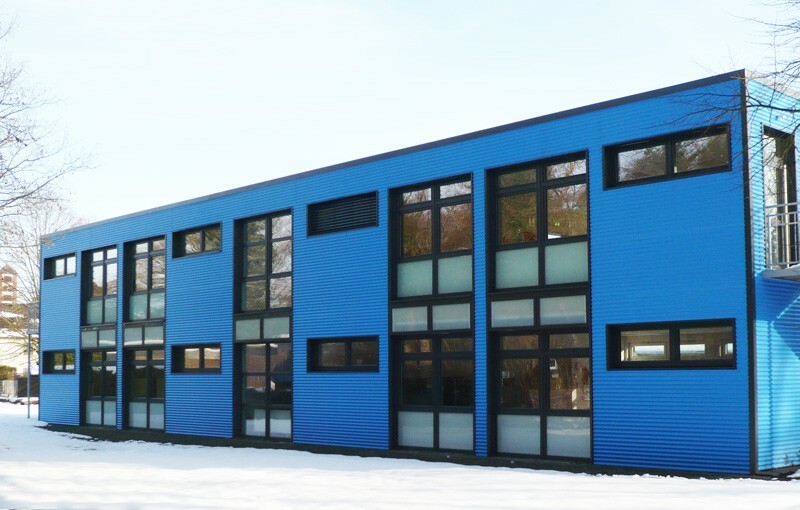 The facade made of aluminium corrugated profiles got a blue powder coat. The bright blue of the facade can also be found in the interior design of the building, in the floor cover as well as in the wall colour and painting of the staircase. The building envelope opens to the South and North with broad windows. The floor-standing windows of both storeys have been formed as open-plan vertical window strips. The intermediate storey has been formed as translucent glass element. The facade is additionally loosened by offsets that are framed with anthracite edge profiles. The staircase is in the centre of the layout, with direct connection to the foyer and the South entrance. The staircase offers access to each storey with two large classrooms, each with open wardrobe niche and sanitary facilities.